With all the grace European dreams conjure and enough grit to keep it interesting, Prague might be the perfect Central European city break. Whether you’ve carved out one day in Prague or a whole week, there’s hardly any city that will compel multiple returns like the Czech capital. The statement holds evermore true when you realize what lies just beyond the city. One of the best reasons to travel to Prague is a chance to explore the region further. The sheer number of incredible day trips from Prague astounds! From the small Czech towns to the big German cities that surround it, Prague is centrally located to take in Central Europe at its finest. An efficient transportation system connects Prague to its outlying areas in the Czech Republic and beyond, making these top day trips from Prague a breeze. Looking for a great place to base yourself with tackling these Prague day trips? Check out our complete guide of where to stay in Prague! If you’re tight on time and want to take on more, I’d recommend renting a car to double up your efforts. Even though some of the town listed below are in close proximity, travelling between them with public transportation will often necessitate backtracking to Prague. Check car rental prices (starting at about $15/day) at AutoEurope. Obsessed with the hauntingly Gothic? Then there’s no better—or quicker!—escape from the capital than Kutna Hora. Much like the Czech capital, the small town of Kutna Hora captivates with its tremendous and varied architectural palette. I’d go as far to say that it’s an essential part of any worthy Czech Republic itinerary. The chilling stylings of Kutna Hora were impressive enough for UNESCO to bestow Heritage Site status upon it. 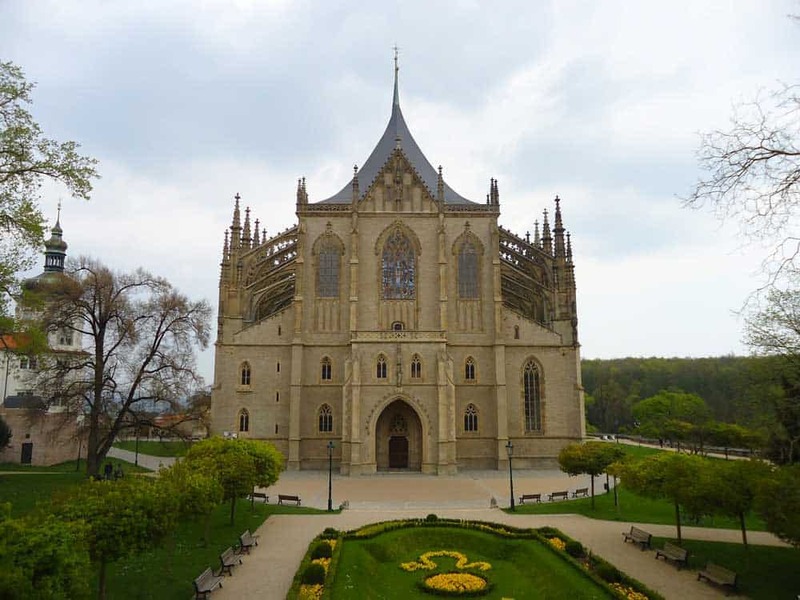 Walking around the town itself is pleasant enough, but its two major sites were enough to tip the scale firmly in Kutna Hora’s favour: Cathedral of St. Barbara and the Sedlec Ossuary. Arriving in Kutna Hora’s main train station, it’s a 15-minute walk over the Sedlec Ossuary. Quite likely, this small Roman Catholic chapel will be one of the oddest attractions you’ll visit anywhere in the world. Hanging from the ceiling and adorning the furnishings are human bones arranged decoratively. Most impressive is the centrepiece, a giant bone chandelier containing nearly every bone in the human body. A macabre scene that could make Edgar Allan Poe shudder, don’t you think? Head further into the historical centre of Kutna Hora—either 35 minutes by foot or less than 10 minutes by bus—to scope out the town’s other big attraction, the Cathedral of St. Barbara. Soaring Gothic spires greet you as you saunter along Barborská. The approach to Cathedral of St. Barbara is one of town’s most famous scenes, fusing views of the countryside with a classic look of one of Kutna Hora’s top attractions framed by 13 stone statues. The resemblance to St. Vitus Cathedral in Prague isn’t accidental. One of the principal architects, Johann Parler was the son of Peter Parler of St. Vitus fame. While the Cathedral of St. Barbara is nowhere near as grand as St. Vitus Cathedral, the project that took over five centuries to complete is a must-see while in Kutna Hora. Not interested in wasting time? Get to see the town as efficiently as possible on a Half-Day Trip to Kutna Hora from Prague! Includes visits to both the Ossuary and Cathedral of St. Barbara (entrance fees included) with an expert tour guide. Direct trains between Praha hl.n and Kutna Hora hl.n. depart hourly. The ride to Kutna Hora takes about an hour and should cost no more than 75 to 120 Kč each way. Ready for a dose of bliss and relaxation? Drop at least one day in Karlovy Vary into your Czech Republic itinerary. The country’s most famous spa town isn’t just for soaking away your stressors; it’s also spectacular place to walk around and admire! The graceful 19th-century architecture of Karlovy Vary is as striking you’d expect from a Czech spa town that has attracted aristocrats and the well-to-do for hundreds of years. That beauty isn’t lost on many. 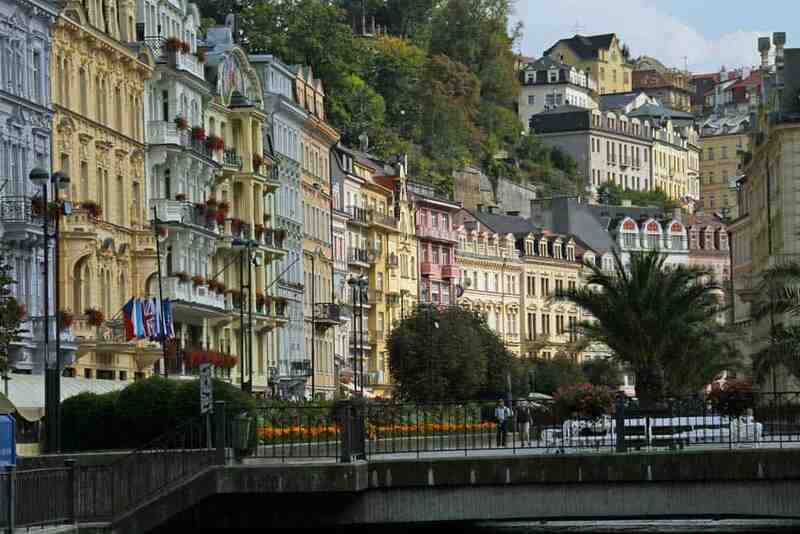 Karlovy Vary is a favourite European scene for filmmakers, gracing the silver screen in movies such as Casino Royale. Fortunately, you don’t have to be James Bond to get the full Karlovy Vary experience. Most day trippers stick to sauntering among the colonnades between sips of curative mineral water. For those who need extra pampering, book yourself in for a full spa treatment. Want to discover Bohemia’s most famous spa town without hassle? Join in on the Karlovy Vary Day Trip from Prague! The tour includes all transportation, lunch, and a visit to the Moser glass factory with a tour guide. Although Karlovy Vary has a train station, buses are much quicker and more convenient for day trippers. Buses from Praha Hradčanská depart every hour from 6:45am and take less than 2 hours to Karlovy Vary. Be sure to purchase tickets for the hourly RegioJet buses (approximately €6-10) as these buses are faster. I won’t claim that visiting Dresden as a day trip from Prague is the perfect way to see the Saxon capital. There’s a ton of things to do in Dresden, not surprising for one of the most interesting cities to visit in Germany. A quick day-outing won’t fully cut it. Nevertheless, if more urban beauty is what you’re craving and you’re stretched for time, Dresden won’t disappoint. 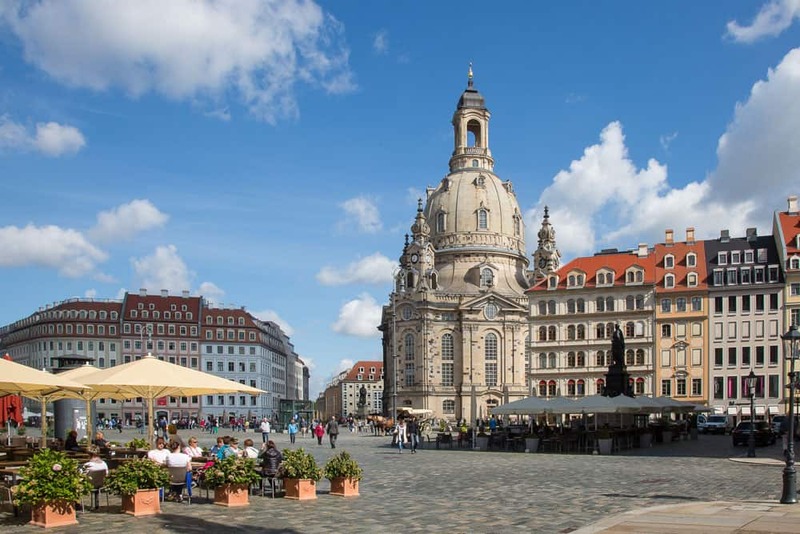 Focus your day-tripping efforts on the beautifully-restored Dresden Altstadt. Following the notorious firebombing campaign in WWII, nearly the entire Altstadt laid in rubble. The spectacular reconstruction though leaves nothing to the imagination. The fine Baroque buildings dotting the Altstadt surge to life the glory of Dresden’s past, even with the originals lost mid-century. The central Neumarkt is a good place to start wandering around Altstadt. The dominating Frauenkirche, the last major building in Altstadt to be restored, stands today as one of the city’s finest. Enter the Baroque-style Lutheran church to admire the restoration work and tour up to the dome walkway for a epic view of the city (€8). Elsewhere in Altstadt, Dresden shows off it’s most stylish side at the Zwinger. The Rococco (Late Baroque) architectural masterpiece is sure to turn your head as you dabble in its gardens and galleries. Walking around the courtyard (my personal favourite part of the palace) won’t cost you anything. If you want to delve into the Zwinger’s three museums—Old Masters Picture Gallery, Porcelain Collection, and Royal Cabinet of Mathematical and Physical Instruments—you’ll need to cough up €10. Depending on how leisurely your pace, there might be time to dig into Dresden’s grittier side in Neustadt. Crossing over the Elbe River presents a completely different view of the city. Unlike the orderly and tourism-friendly streets of Altstadt, Neustadt has a lived-in and authentic flavour. Neustadt isn’t heavy on tourist sites, but is fun to wander around. The district’s street art, hip cafés and vintage stores are magnets for a youthful crowd, a buzz that’s evident as you ply through. If there’s any must-see in Dresden Neustadt it’s Pfunds Molkerei (Pfund’s Diary Shop), a milk shop opulent enough to be straight from the mind of a mad king. Want to get the full low-down? 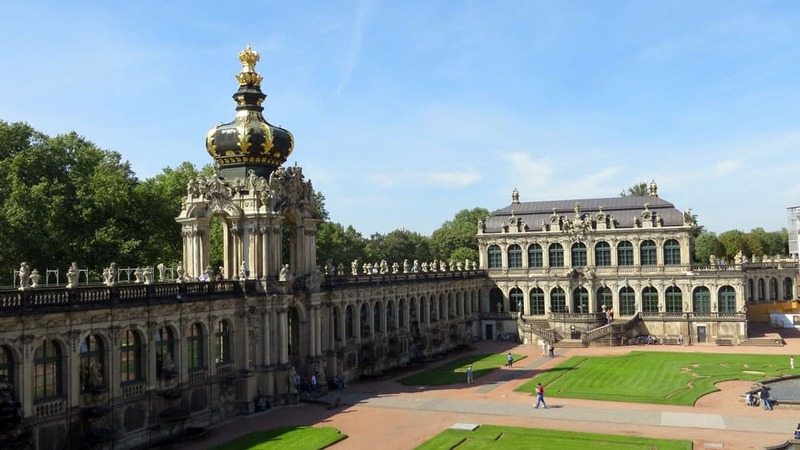 Join the Dresden Day Trip from Prague and learn about this fascinating Saxon city with an expert tour guide! Both buses and trains are convenient to travel better Dresden and Prague. Fast EC trains leave Praha hl.n. for Dresden Hbf. every 2 hours starting in the early morning. The fastest trains take just over 2 hours. You can check schedules on bahn.de, but it’s worth checking prices in the Czech Republic before booking. Train fares are generally cheaper on the Czech side of the border. No self-respecting beer lover leaves a day in Plzen (Pilsen) out of the running. In the late-19th century, Josef Groll, a Bavarian brewer living in Pilsen, spun up a concoction that forever changed the world of beer. It become known as pilsner, a fitting German-language tribute to the origin of Groll’s creation. Soon, that beer style took the world by storm. Some of the world’s best selling beer brands derive their recipes and brewing method from Groll’s discovery. But before you sneak in another sip of that barely-drinkable Budweiser, pop into this small Czech city for a taste of you’re missing out on. Pilsen is home to two major breweries, Pilsner Urquell and Gambrinus, both harkening from the late 1800s. Discovering these two Czech beers in their home is much like savouring a pint of Guinness in Dublin. (Though Guinness still gets my vote.) Even if these two pilsners aren’t the best beers in the Czech Republic, sipping them at their freshest can’t hurt! 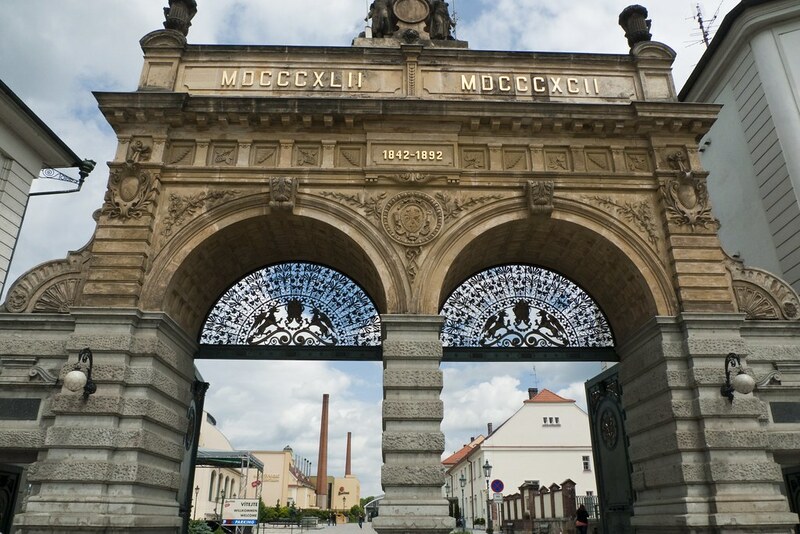 To glean the entire story of Pilsen’s beer production, stop by Plzeňský Prazdroj for a brewery tour. Yes, there’s more to Pilsen than brewing. Much like other urban outings from Prague, the old town of Pilsen is the perfect place to burn some calories walking. Start your exploration of tightly-packed Old Town Pilsen around Republic Square. The expansive main square is crowned by St. Bartholomew’s Cathedral, a Gothic masterpiece sporting the tallest church tower in the Czech Republic. Scale up over 300 steps to the top of the bell tower for tremendous views over Plzen and—on a clear day—as far as the Sumava Mountains. Besides St. Bartholomew’s Cathedral, seek out Pilsen’s Great Synagogue. The “Great” isn’t just a unqualified marketing label. This Moorish Revival tour de force is the second largest synagogue on the continent and third largest in the world. A little surprising for a mid-size city in the Czech Republic, isn’t it? Between Prague and Pilsen, trains leave hourly throughout the day. The journey takes about 1 hour and 37 minutes (100-160 Kč). Some buses are slightly quicker than the train, but more expensive. If you do decide on buses, be sure to check journey times as some services are slower than others. It’s hard to generate intense excitement about a side trip to Terezin Concentration Camp. A sobering experience, any visit to Terezin is bound to arouse some emotions as you relive the horrors of Nazi occupation in the Czech Republic during World War II. Founded in the late-18th century as a fortress to protect Prague, Terezin became something quite opposite as the Nazis pushed across Europe. As Hitler surged his plans forward, he converted Terezin (Theresienstadt in German) into a Jewish Ghetto. 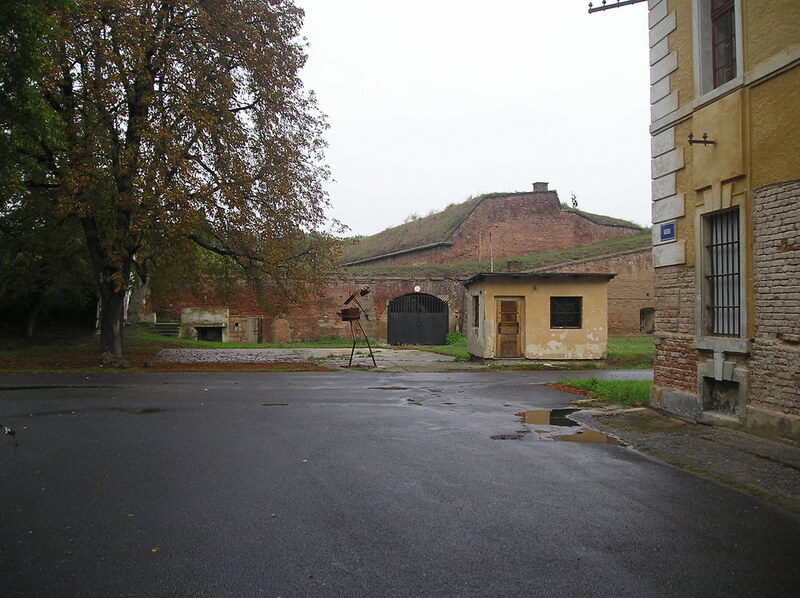 Over its lifespan, Terezin housed almost two hundred thousand people, as many as over 50,000 at a time crammed into close quarters. Disease and malnourishment ran rampant at Terezin Concentration Camp. Although not a death camp like Auschwitz-Birkenau or Dachau, almost a hundred thousand perished while living in Terezin. Today, the Terezin Concentration Camp houses a memorial to all the victims of Nazi rule in the Czech Republic. A guided tour weaves in stories of Terezin’s former residents, a haunting experience that will be forever etched in your memory. Buses to the town of Terezin leave Praha Holesovice approximately every four hours. The trip lasts just short of an hour. Expect to pay about 80 to 110 Kč each way. Alternatively, hop onto the Terezin Concentration Camp Day Tour. The tour leaves from Republic Square in Prague and includes all transportation and entrance fees. If promises of a castle fit for fairytales failed to deliver in Prague, visiting Karlstejn is a must. Hovering over the village of the same name, Karlstejn Castle is one of the crown jewels in Czech Republic’s tourist stash. And with the minimal effort and time needed to get here, there’s no excuse to zip over for a peek. Czech king and Holy Roman Emperor King Charles IV, of Charles Bridge fame, established Karlstejn Castle way back in 1348. Despite its regality, Karlstejn Castle never served as a full-on royal residence. Certainly, Ol’ Karl popped in from time to time; the real purpose of Karlstejn Castle, however, was to protect royal treasures including the coronation jewels. Touring Karlstejn Castle today, you’ll have to hop on a guided tour (self-guided is not allowed). Four routes are available through the castle. Most visitors opt for Route II, a walk through the castle’s two main towers (Marian and Great Towers) and the impressive St. Catherine Chapel. You’ll need to book this tour in advance as visitor limits apply. Visit the official Karlstejn Castle site for opening times and tour availabilities. Want to make the most out of your day? 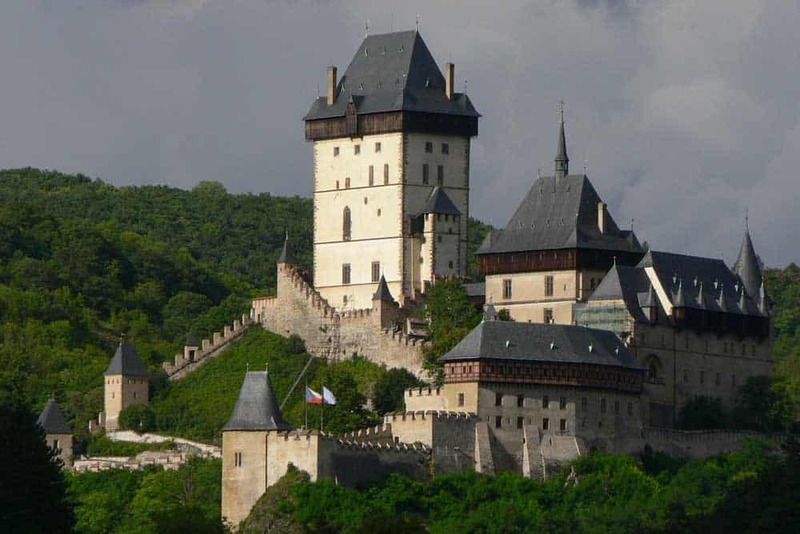 Hop onto the Half-Day Karlstejn Castle Tour from Prague! Trip includes a 5-hour guided tour of the castle and return transportation from Prague. Trains to Karlstejn leave every 30 minutes from Praha Hlavni Nadrazi. The journey only takes 40 minutes, making it one of the quickest and easiest Prague side excursions. From the station, bank on an additional 40-minute walk to the castle over slightly strenuous terrain. Barely close enough to the Czech capital cling onto this list, Cesky Krumlov will leave you as enchanted as any destination in the area. Once a hidden Bohemian gem embracing snaky bends of the Vltava, the evermore-popular Cesky Krumlov is hardly the secret it once was. Cesky Krumlov is now one of the top places to visit in Czech Republic. And while the crowds don’t approach Prague-like proportions, the small town centre is crammed enough that you’ll need a little patience to get through the day. Start off your exploration at Cesky Krumlov Castle. Walking through the castle grounds, sucking in delectable panoramas of Cesky Krumlov’s town centre, is free. Cough up 50Kč to plow up the castle tower for even bigger views of town. A proper sizing up of the castle will take well over an hour, especially if you pay to tour the interiors including the Castle Baroque Theatre. Downhill from the castle, the pedestrian street Latrán—lined with shops, cafés and restaurants—leads into a historical town centre squeezed between bends of the Vltava. Grab a bite to eat and explore the old town by foot to round out your day. Overnight in Cesky Krumlov if you’d like to tackle the Vltava on a rafting trip or hike along the beautiful trails around town. Summoning the spirit of Vang Vieng in Laos, Cesky Krumlov even offers a river tubing pub crawl for the more youthful among us! 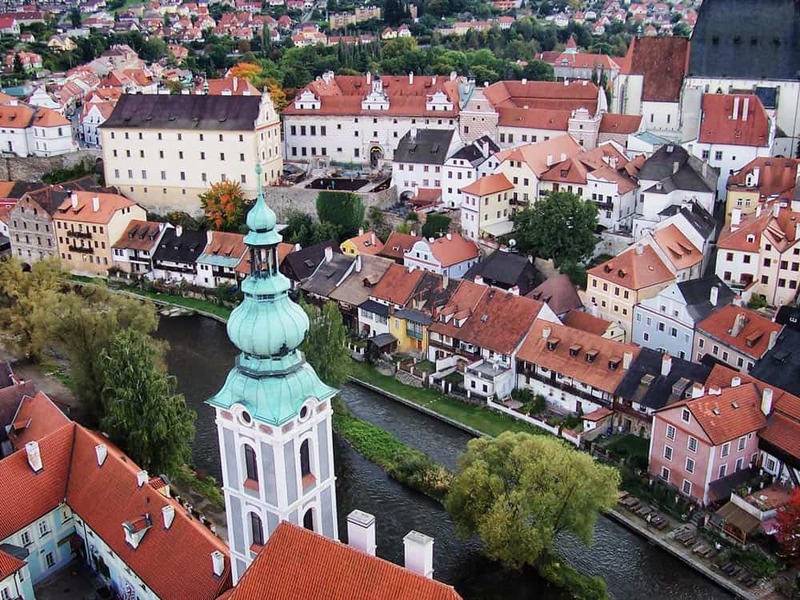 Want to take the hassle out of visiting Cesky Krumlov? Book yourself on a Cesky Krumlov Day Trip from Prague! The tour includes transportation to/from Prague and accompaniment by an expert guide. Day trips to Cesky Krumlov are a little more difficult with public transportation. Buses between Prague and Cesky Krumlov leave regularly and take about 3 hours each way. To save time, you’re better off to take an organized tour or rent a car. By driving, you’ll save yourself about one hour of transit time each way. You’ll have to start out early to bring a day trip from Prague to Brno to its full potential. Sure, Czech Republic’s second city doesn’t hold a candle to Prague. (What city could?) But there’s more than enough things to do in Brno to squeeze a full day out of it. The historical centre of Brno is crammed with sites to rev up your senses. Start exploring with the ascent up Petrov Hill to the Cathedral of St. Peter and Paul. The twin neo-Gothic towers, dominating nearly every panorama of Brno, betray a Baroque interior that’s far less ostentatious that many churches of the era. Propped up on another hill, a 20-minute walk opposite the cathedral, looms Špilberk Castle. Once the most feared prison in the land, Špilberk Castle tamed its harsh reputation to take its place among the top attractions in Brno. 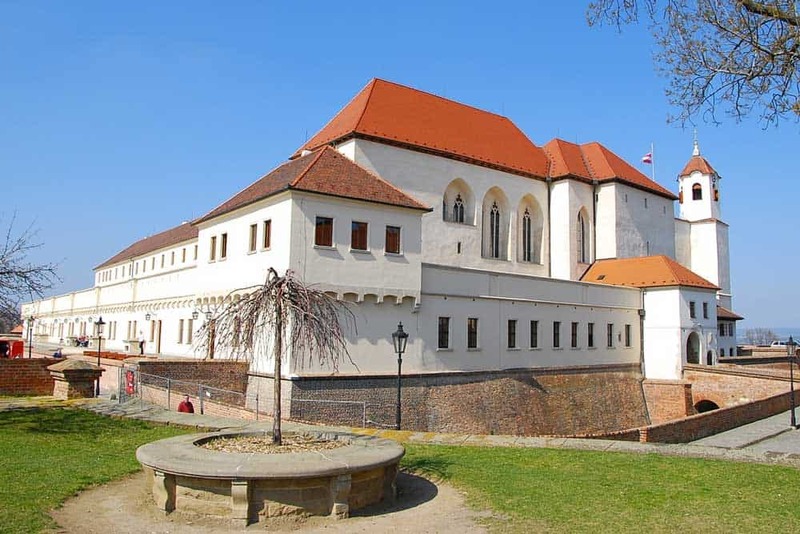 Today, the castle is home to the Brno Museum and an exhibition that documents its chilling penal history. Take a breather at Špilberk Castle to clear your lungs among big city views. Down in the town centre itself there’s no better way to get to know Brno than to wander without a plan. The heart of the city beats at Náměstí Svobody (Liberty Square). Head down any of the arteries from here to discover the diverse architectural palette of Brno. Save some time—if you dare!—for The Ossuary of St. James Church. Like Sedlec Ossuary in Kutna Hora, the Brno Ossuary is a little (okay, more than a little!) creepy, featuring walls and ceilings bedecked with perfectly-arranged human bones. Next to the Catacombs of Paris, the Ossuary of St. James Church is Europe’s second-largest ossuary. That alone should warrant a visit! Trains are the most convenient way for starting a day trip to Brno from Prague. From Praha hl.n. trains depart every hour for Brno. The fastest trains take approximately two and a half hours to reach Brno for 220-340 Kč. 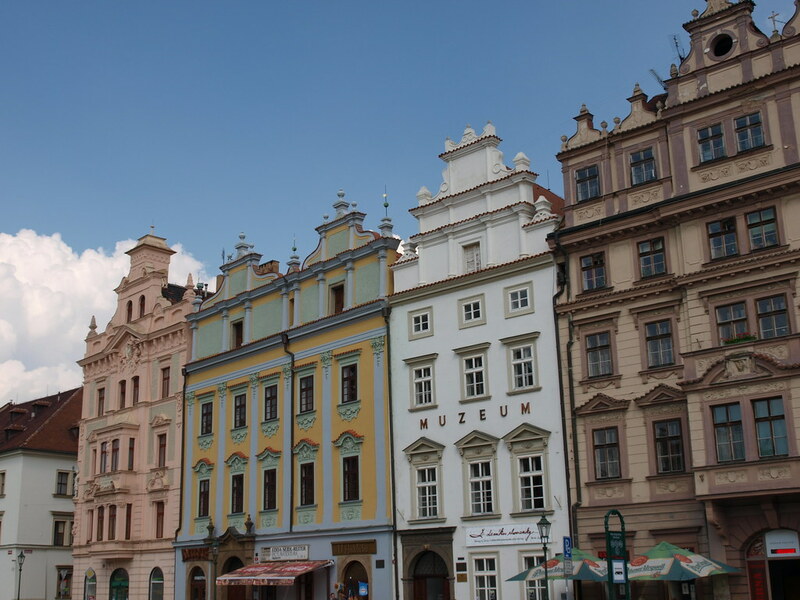 Not many outings from the capital are as captivating as a day trip from Prague to Olomouc. 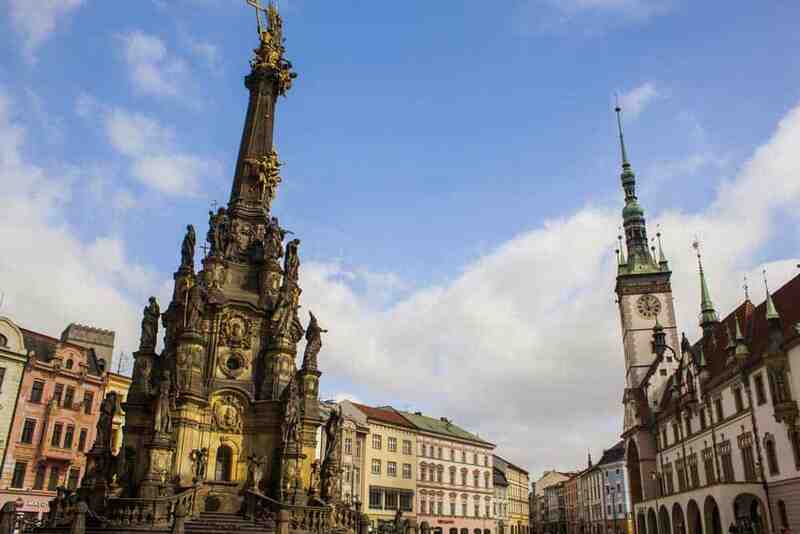 Oft absent from Czech Republic itineraries, Olomouc is an urban getaway that surprisingly escapes the crowds of Prague. Start exploring Olomouc at Upper Square (Horní náměstí). This elegant main square contains the city’s most historically significant site, the UNESCO-listed Holy Trinity Column. The monument dates back to the early-20th century, depicting religious motifs in Baroque style including the twelve apostles, the assumption of Mary and—of course—the Holy Trinity. Elsewhere on the square, poke your head into the Olomouc Town Hall. Guided tours leads you through the building, but the real treat is to climb the town hall tower, at either 11am or 3pm, for views of Olomouc’s old town. At Olomouc Town Hall, much like in Prague, a chronological surprise awaits. One of the two remaining astronomical clocks in the Czech Republic sits on the face of the town hall. Unlike the timeless medieval beauty of Prague’s, Olomouc Astronomical Clock is a unique work of Socialist-Realism hailing from the restorations of the post-WWII era. Visit the clock at noon to witness the communist-tinged procession of proletarian blacksmiths hammering out a tune. Trains leave Praha hl.n. hourly for Olomouc. The fastest trains should take just over two hours, costing between 220 Kč and 330 Kč. Be sure to verify journey times before purchasing a ticket. Looking for the best big urban escape close to Prague? Jet over the German border to the wonderfully-reconstructed Baroque city of Dresden. Need a quick small town jaunt? Head an hour outside the city to the beautiful Czech town of Kutna Hora. Got some stress to release? Book yourself a relaxing spa day among the curative mineral waters of Karlovy Vary, the Czech Republic’s most famous spa town. Feeling a tug from the dark side? 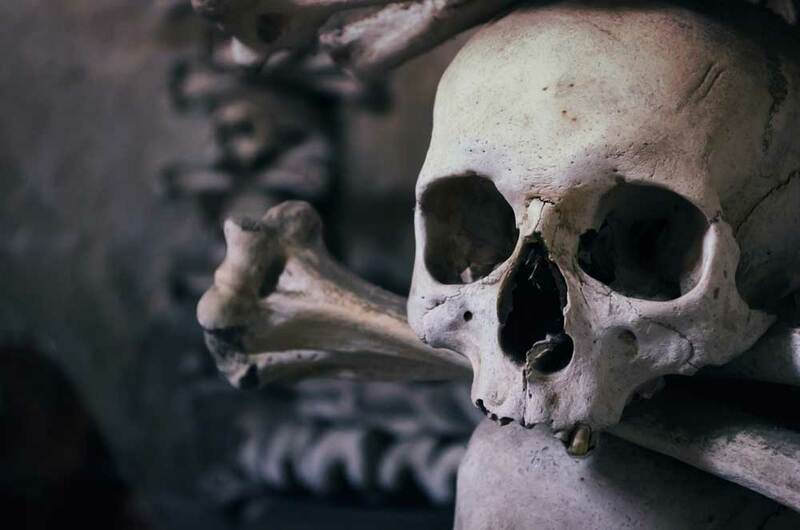 Visit the Czech Republic’s two eeriest sites: Sedlec Ossuary in Kutna Hora and The Ossuary of St James Church in Brno.